I had an opportunity to travel to Paris when I was in college. I remember visiting a patisserie along Rue Cler in the heart of Paris and enjoying a light, buttery croissant one morning. It was pure decadence. The French certainly have a knack for making pastries, and recently I learned local baker Jenna Tucker does, too. Tucker opened Milk & Honey Bakery in Plainfield, Indiana, June 1. The bakery offers a wide-selection of French-inspired pastries and desserts, as well as coffee drinks. I visited the store at 111 S. Vine St. in Plainfield recently. When I walked in, the first thing I noticed was the modern farmhouse-style decor. 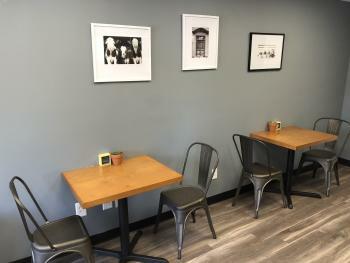 There is a large table in the front, and to the left of the counter I noticed another seating area with several small tables. A friendly barista greeted me. I decided to try a few different items from the bakery. My options included ham and cheddar croissants, muffins, eclairs, cream puffs, tarts, a variety of sweet croissants, macarons, and more. I chose to take home a croissant, a hazelnut latte macaron, a vanilla bean macaron and a double chocolate shortbread to try with my family. I also got an iced vanilla latte to go. After trying our treats, the verdict was in: every item we tried was a winner. If I had to choose a favorite, though, I think it would be a tie between the croissant and hazelnut latte macaron. Macarons are hard to perfect, but Milk & Honey Bakery&apos;s macarons are fantastic. I talked to Tucker after my visit, and she told me a bit about herself and the bakery. She was born and raised in North Carolina and dreamed of owning a bakery since she was 4 years old. Now 26, Jenna and her husband settled in Plainfield to achieve that dream. 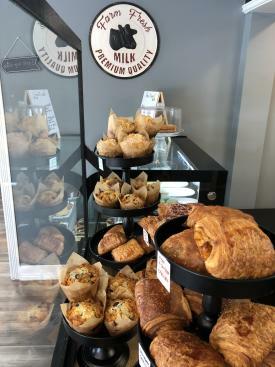 Tucker said her pastries are indeed French-inspired, but she also likes to incorporate similar ingredients from food she has tried into her pastries. She especially likes to play around with seasonal flavors. Her best seller at the bakery is the Vanilla Glazed Croissant, which makes sense, because the day I went they were sold out. Tucker said Milk & Honey Bakery uses Tinker Coffee Co., which is located in downtown Indianapolis. The bakery makes its own flavored syrups for the coffee drinks, including honey vanilla, mocha, caramel and classic vanilla. The best insider tip I learned from Turner is that Milk & Honey Bakery posts specials on its Facebook page, so be sure to watch social media for special offers. Milk & Honey Bakery is open 7 a.m.-4 p.m. Monday-Saturday and closed Sunday. Be sure to check it out!